Angels Crest Highway, or SR-2, twists its way through 66 miles of the Angeles National Forest, punctuated by the jagged San Gabriel Mountains. Finding its end points at La Cañada-Flintridge and the Mountain Top junction at SR-138, it is a marvel of vistas, fresh air, stargazing, and relative solitude—a welcome reprieve for anyone aching to escape the bustle of Los Angeles below. A popular ride for intrepid road bikers, this well-paved, iconic, and historic scenic highway typically doesn’t experience an overwhelming amount of traffic, motorized or otherwise, though it's not unheard of to get stuck behind a painfully slow moving vehicle. While the motorcycle traffic spikes on the weekends, the treacherous turns keep speeds low and prompt caution. Because the route climbs as high as 7,000 feet, a late fall or early spring trip through the single-lane highway is likely to feature snow. Be sure to check road conditions prior to embarking because the road will often close in the wintertime. Likewise, many of the best and most accessible campgrounds and day use areas are closed even if the road may be navigable. Be sure to check before you go. Nestled among the rugged landscape, campsites like Chilao, Buckhorn, Horse Flats and more are excellent higher-altitude getaways and offer access to hiking trails and other adventures. Mountain biking trails weave through the tangle of white alder, sage, and shrubs, while some of the best bouldering and trad climbing in the greater Los Angeles area is found in the surrounding hills. Horseback trails are plentiful, as are excellent day hikes and overnight backpacking adventures. The intrepid explorer is presented with hikes that tromp down among sharp canyons and up to the top of thundering peaks. Even someone as motivated as John Muir could spend years exploring these mountains and never exhaust his excitement. Opportunities to see a wide variety of fauna like bears, cougars, coyotes, and an array of birds are frequent, and make it hard to believe that the chaos of the densely-populated city is just miles away. Iconic and historic scenic highway. 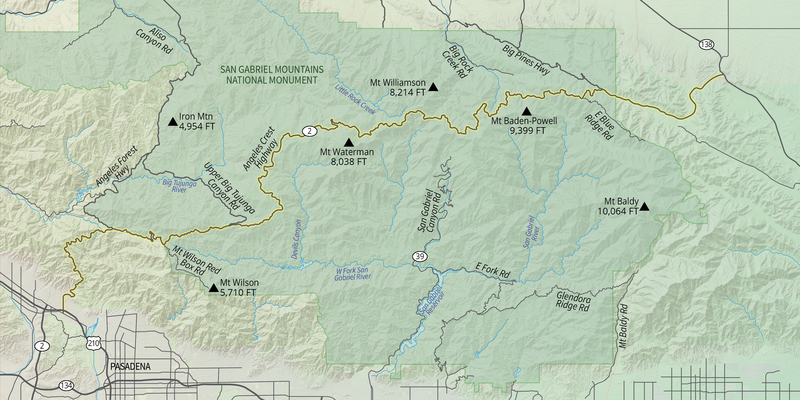 Viewpoints, picnic areas and hikes along route. Very curvy and slow moving road. Closed at Highway 39 intersection during winter months.